Adding chronic or severe pain to the list of qualifying conditions for medical marijuana has a huge impact on the size of a given market, as evidenced by the overwhelming percentage of registered patients using MMJ to treat the condition. 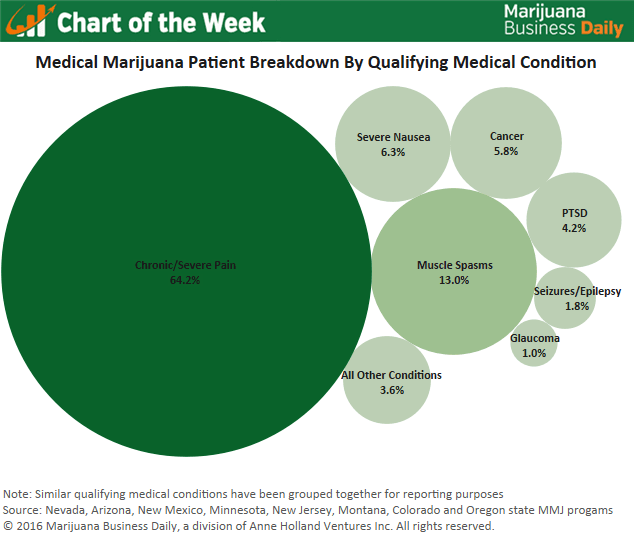 A combined 64.2% of patients in Arizona, Colorado, Minnesota, Montana, Nevada, New Jersey, New Mexico and Oregon – the only states that publicly release patient counts by condition – list chronic/severe pain as a reason for using medical cannabis, according to an analysis of publicly available data. Taken together, these eight markets represent approximately 400,000 of the estimated 1.5 million medical marijuana patients in states with active MMJ programs. The remaining 36% of patients in the states analyzed are using cannabis to treat a disparate set of medical conditions, primarily muscle spasms, severe nausea, cancer, post-traumatic stress disorder, seizures/epilepsy and glaucoma. The figures are of particular relevance to entrepreneurs eyeing new medical marijuana markets and business owners in states where qualifying condition lists are still in flux. Revenue expectations and patient counts are inextricably linked to these qualifying conditions lists, and the inclusion of chronic/severe pain will significantly impact each state’s addressable market. Case in point: Minnesota has one of the smallest patient bases in the country, and it also did not allow the use of medical marijuana to treat chronic/severe pain until recently. Now that patients can use MMJ for pain, the market is expected to grow significantly. Another example: Illinois, which doesn’t include chronic/severe pain on its MMJ conditions list, has struggled to maintain a patient base sufficient enough to support the 52 state-authorized dispensaries. In the remaining states that provide detailed information, chronic/severe pain is either the largest or second-biggest medical condition listed by patients. The argument against adding chronic/severe pain to a state’s list of qualifying medical conditions stems from the broad definition of chronic or severe pain, and the lack of a definitive test to prove that patients are indeed suffering from such symptoms. It’s the same reason many psychological conditions, such as ADHD or bi-polar disorder, are not approved to be treated with cannabis. Aside from pain, some other medical conditions can bolster the market noticeably as well. Post-traumatic stress disorder in particular is an important condition for the industry. PTSD accounts for 4.2% of patients using medical marijuana in the eight markets analyzed, a relatively high figure considering it only appears on four of these states’ lists of qualifying conditions. The percentage will likely increase over time, as more states are expected to add post-traumatic stress disorder to their conditions lists. Illinois, for instance, was recently ordered to place PTSD on its list, which is expected to give the market a solid boost. The medical conditions that qualify patients to use cannabis as treatment differ significantly from state to state, and it’s in the best interest of industry operators in all states to understand and quantify the unique financial impact the inclusion, or absence, each of these medical conditions presents to their business.